Lavacore is a technically advanced fabric, constructed and engineered exclusively for water sports requiring the ultimate in thermal control and superior comfort. This unique synthetic construction closely matches the stretch and movement of a traditional Lycia, while providing the insulation qualities similar to that of a neoprene. Close to the skin, Lavacore's soft internal fleece and high 4-way stretch produces the ultimate comfort-warmth-weight ratio, a true leader amongst any fabrics within the water sports industry. Wet or dry, hot or cold, Lavacore helps control your temperature longer. 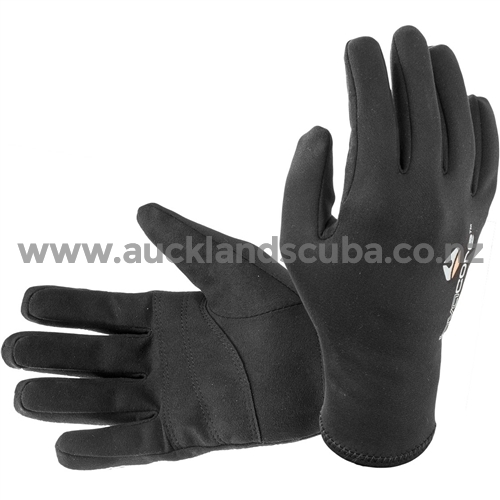 A great warm-water glove protects you from unwanted scrapes and cuts about and below the water. The perfect glove during those icy mornings fishing, waterskiing, and paddling - the journey is your choice. Wind-proof middle layer provides anti-wind chill properties and ensures warmth in cold conditions. Water resistant outer layer facilitates fast water run-off and quick drying. Light weight and 4-way stretch makes Lavacore incredibly comfortable to wear. Breathable middle layer allows moisture to be drawn away from the body on the surface. Lavacore is neutrally buoyant so it won't add to your weight belt requirements. All seams are overlapped during flat-lock sewing to decrease water flow. Anti-bacterial inner fleece minimizes odor and eliminates bacteria growth and these gloves provide SPF 30+ protection. Gloves are available in sizes X-Small, Small, Medium, Large, X-Large or 2X-Large are Black in color and are covered by a 12 month limited warranty.